Facts and information about Latvia, including stats about the government, climate, geography, population, economy and culture. Background: Along with most of the other small nations of Europe, Latvia shares a history of invasion by a succession of expansionist nations, e.g., Sweden, Poland, Germany, and Russia. After a brief period of independence between the two World Wars, Latvia was annexed by the USSR in 1940 under the Molotov-Ribbentrop Pact. 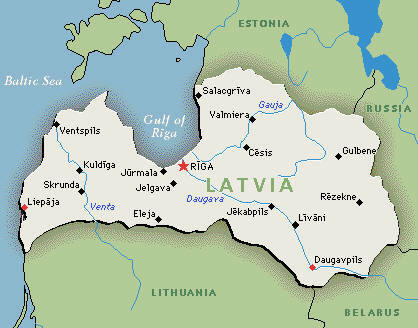 The USSR recaptured Latvia from its German occupiers in 1944. Latvia reestablished its independence in August 1991, a few months prior to the collapse of the Soviet Union; the last Russian troops left in 1994. The status of ethnic Russians, who make up 30% of the population, is an issue of concern to Moscow. Unemployment has become a growing problem and Latvia hopes to receive an invitation to begin EU accession talks by the end of 1999. 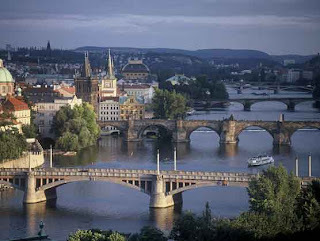 Prague is a vacation destination that offers beautiful architecture and plenty of breathtaking views. 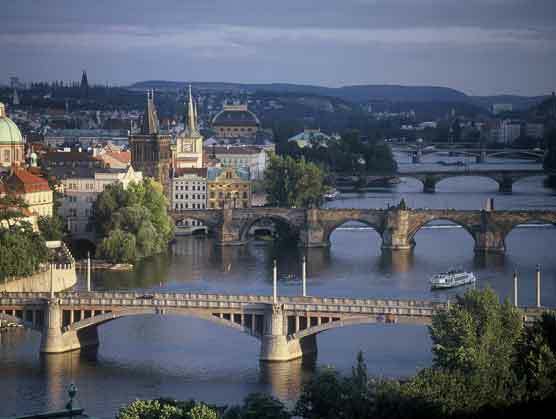 After their first visit, many people would immediately argue that Prague is the most beautiful city in Europe. Regardless of whether that's what you're hoping for on your next vacation, there's a good reason that thousands of tourists flock to the city every spring and summer. Its breathtaking views, well-preserved architecture, and the dark, gothic aura surrounding its churches and castles lend Prague a highly evocative sense of history on even most casual stroll through the city center. The first must-see destination that most tourists head to is Old Town Square, where the main attraction is the city's Astronomical Clock, whose tiny mechanical saints deliver an hourly performance when the clock chimes to the flashes of cameras and glee of the crowds. In summertime the square's pavement is lined with the tables of upscale outdoor cafés, giving your break from a long day of sightseeing an unabashedly decadent feel while you sit back and do some leisurely people-watching. In the wintertime the square is decorated with Christmas trees and packed with souvenir booths, making it the perfect outdoor setting to enjoy a hot cup of grog. Admittedly, this area is so dense with hoards of tourists in the spring that with its "so-perfect-that-it's-surreal" buildings and narrow, winding streets, it could be described as strangely reminiscent of Disneyland. Those who'd prefer to drink their espresso in the company of locals can find refuge only a few minutes' walk away, in quieter cafés such as the cozy Literary Kavarna, which features a bookstore and courtyard seating, or the more laid-back Monmartre, where a Czech Surrealist group purportedly still meets. 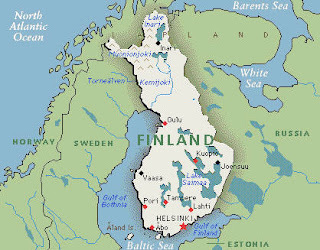 What is Finland and other information about this mysterious land. Background: Long ruled by foreign powers, including Sweden and the pre-revolutionary Russian Empire, Finland finally declared independence in 1917. During World War II, Finland fought the USSR twice and then the Germans toward the end of the war. In the following half-century, the Finns made a remarkable transformation from a farm/forest economy to a diversified modern industrial economy. Per capita income has risen to the West European level; Finland is a member of the European Union and is the only Nordic state to join the euro system at its initiation in January 1999. Economy—overview: Finland has a highly industrialized, largely free-market economy, with per capita output roughly that of the UK, France, Germany, and Italy. Its key economic sector is manufacturing—principally the wood, metals, engineering, telecommunications, and electronics industries. Trade is important, with the export of goods representing about 30% of GDP. Except for timber and several minerals, Finland depends on imports of raw materials, energy, and some components for manufactured goods. Because of the climate, agricultural development is limited to maintaining self-sufficiency in basic products. Forestry, an important export earner, provides a secondary occupation for the rural population. The economy has come back from the recession of 1990-92, which had been caused by economic overheating, depressed foreign markets, and the dismantling of the barter system between Finland and the former Soviet Union. Rapidly increasing integration with Western Europe—Finland was one of the 11 countries joining the euro monetary system (EMU) on 1 January 1999—will dominate the economic picture over the next several years. Growth in 1999 probably will slow, perhaps to 3%, a barrier to any substantial drop in unemployment. A brief introduction to Finland, with a tour and information about the european country. Situated in northern Europe between Sweden and Russia is the country of Finland. Finland covers a total area of 338,145 km2 that is covered in ice and snow for up to six months of the year. 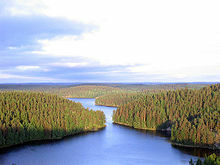 Finland is one of world's last great wildernesses. 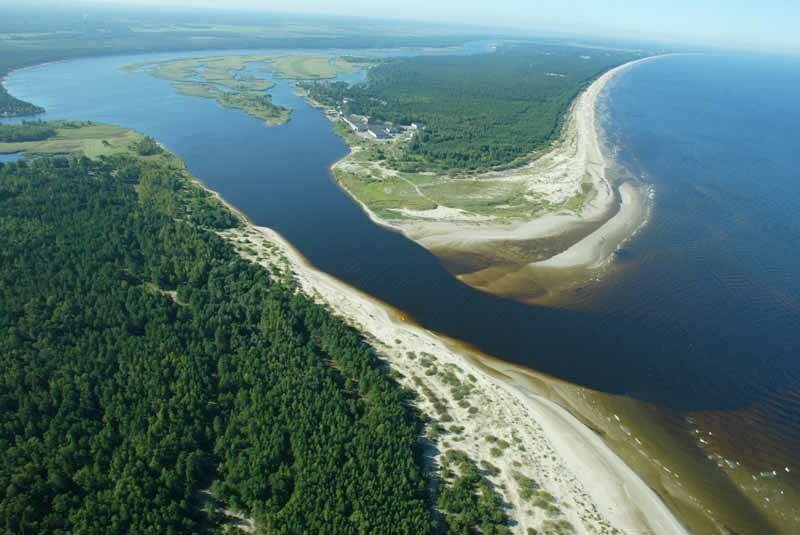 It has over 60,000 lakes and rivers, and over 100,000 islands - one for every 55 of its inhabitants. With timber being Finland's major export item, it is not surprising that the country is covered in forests of pine trees and white birches. There are no towering mountains, as there are in Norway, and Finland is relatively flat with an average height of 152m. Finland has a climate that is extreme in regions north of the Arctic Circle, and temperatures may fall to -30C during the 6 months of winter. In this period it is rare to be able to view the sun as it only rises for a short period of time. It isn't surprising that the Sauna originated from Finland. In the months of May, June and July, Finland celebrates its summer season. 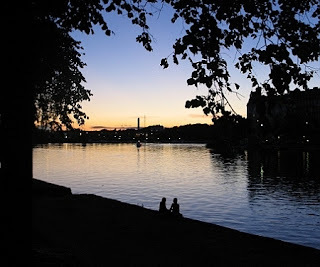 The summer sun (known as the Midnight Sun) doesn't set for three months and the people enjoy spending time in the great outdoors. Finland is divided up into 12 provinces with over 50% of the population living in the five southernmost provinces. Finland's major cities and towns are Helsinki (capital), Espoo, Tampere, Turku and Vantaa. The two official languages of Finland are Finnish and Swedish, with approximately 5% of the population speaking Swedish. English is also taught at all public schools, and Finland boasts a 100% literacy rate. With religion, the population are mostly Lutheran, with 1% being Greek Orthodox. In addition, there are approximately 16,700 Jehovah's Witnesses, 13,192 members of the Evangelical Free Church, 1,309 Jews, and 926 Muslims. Finland is an independent nation. Its government employs a President, who holds supreme executive power. Finland gained its independence in 1917, where previously at different periods of time in history, Russia and Sweden ruled the country. Finland is famous for its creative Architects and Musicians. Finland is also the home of the famous mobile phone, Nokia. Ice Hockey, Fishing, Skiing, and Ice Skating are the most popular sports in Finland, but Finland has also produced famous Rally drivers. With its cold, long winter, Finland's tourism increases in the summer. With beautiful buildings to view in the cities, and a vast amount of lakes and rivers to explore in the country-side, Finland is truly an enchanting country to visit. Finland is not only a beautiful country to visit, but it is also rich in fun, activities, culture and things to do. On planning a vacation to Finland, one will be pleasantly surprised at how family-oriented the country is. Whether your family is active or seeking a more cultural experience, Finland will be sure to please everyone of all tastes from the youngest child to the hard-to-please teenager. Finland is a large European country with interesting attractions in all its regions. 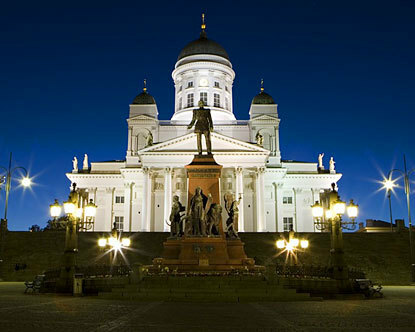 Helsinki, the nation’s capital, is perhaps the most popular place for the tourist to visit. This city boasts eleven museums such as the Finnish National Gallery, the Museum of Cultures, and the Maritime Museum. 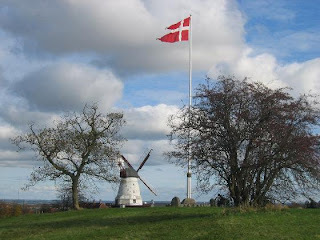 The city also has a zoo with a wide variety of animal species and the local amusement park, Linnanmaki is a day happily spent. Also near Helsinki is the Serena Water Park, the largest park of that type in all of Europe. Even in the heart of winter, you and your family can slide down water slides and float in heated wave pools. This Water Park also has a ski center attached to it. A trip to Finland is not complete until one takes in the scenery of the countryside. A country of mountains and beautiful forests, there are many places to hike. Other sports that the country provides is, of course, cross-country and alpine skiing, snowboarding, mountain biking, snowmobile safaris, fishing, and husky-drawn sleigh rides. This Scandinavian country is one of the most beautiful in Europe since so many of its forests are well maintained and well cared for. While touring the countryside, there are many other attractions to see. Castles and ruins are numerous as are the lighthouses which give the tourist a beautiful view of the sea. The Untamala Archaeology center, located in the village of Laitila, allows tourists to walk amongst the ancient graves of a stone age graveyard and a medieval village. The Northern region of Lapland is almost a vacation in itself. Here lies the infamous Snow Castle, or Luni Linna as the Finnish people call it. This hotel is sculpted entirely from ice and even has a restaurant that serves warm meals and beverages. While staying there, you and your family can visit the Ranua Wildlife Park. This park has large enclosures for its 150 species of native animals including the polar bear. An activity that native Fins enjoy is ice water swimming. This is where they change into bathing suits and warm themselves in saunas and then run into a nearby frozen lake to cool off. If you and your family want to stay in one place then Finland also has a wide variety of resorts. Tahko, which is located in central Finland has three hotels and 650 holiday apartments. A family can golf here or go canoeing, hiking, or skiing as the weather permits. Another great family resort is the Kalajoki Sand Dunes. Open only in summer, the kids can play for hours in the long, shallow beaches and then go to the Juku Juku Maa Amusement Park. There are also a spa, an animal park, and great nightclubs that suit all tastes. Finland is not only a beautiful place to go on vacation, but a fun experience as well. Everyone in your family will enjoy the warmth and enthusiasm that this country invokes. Facts and information about the history of France, including stats about the government, climate, geography, population, economy and culture. Background: Although ultimately a victor in World Wars I and II, France lost many men, much wealth, its extensive empire, and its rank as a dominant nation-state. France has struggled since 1958—arguably with success—to construct a presidential democracy resistant to the severe instabilities inherent in the parliamentary democracy of early 20th century France. In recent years, its reconciliation and cooperation with Germany have proved central to the economic integration of Europe, including the advent of the euro in January 1999. Grasse, in Southern France, the place where most of the world's most exotic perfumes are made. Grasse has been called 'the perfume capital of the world' and despite four centuries as the Queen of Perfume it still rightly deserves this title. The town has more to offer the visitor than wonderful ornate bottles of scent however, and this article will describe Grasse's rich history, it's many tourist attractions and will explain why the area is ideal for perfume production. Situated a mere fifteen kilometers north from Cannes, the French Riviera's lure for the rich and famous, Grasse is also close to the city of Nice (30 minutes east by car). The town is nestled amongst wonderful countryside enjoying a backdrop of hills, forests, rivers and canyons. Public transport connecting Grasse with the other major towns in the Alpes-Maritime region is by bus - there is a regular service daily between the towns of Cannes, Nice, Vallauris (the 'home' of pottery), Antibes and Silicon Valley - Sophia Antipolis. Despite being so close to the fine sand beaches of Cannes, with their stifling heat in summer, Grasse at an altitude of 300 - 400 meters enjoys a fresher climate all year round. The plentiful sunshine and mild temperatures make the town and surrounding areas ideal for flower growing, and thus ideal for the production of perfume. The importance of scent in Grasses' history is brought to life at the Musée International de la Parfumerie - a museum in the town which provides details of the process of perfume manufacture and covers 3000 years of the industry's history. The museum's chief treasure is the travel case of Marie Antoinette and the building also houses a greenhouse where the public can experience the all-encompassing, aromatically fragrant plants and flowers growing at first hand. There are also many perfumeries in the region, including Molinard, Galimard, Salon des Parfums etc, which are open year-round to the public. 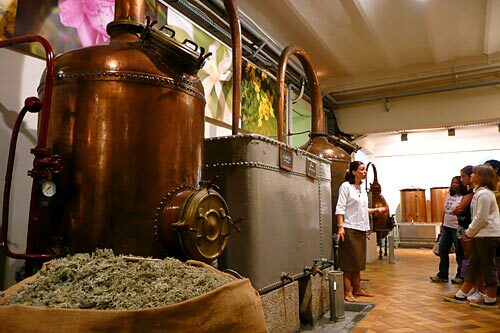 Visitors can enjoy the free, guided tours provided by the perfumeries, watch the process of perfume manufacture, learn the history of Grasse's importance in the industry and buy products in the on-site shops. 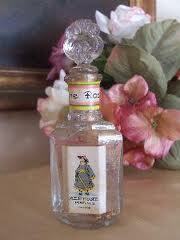 The perfumes on sale are typically packaged in ornate bottles bearing a flower encased for perpetuity in the glass. 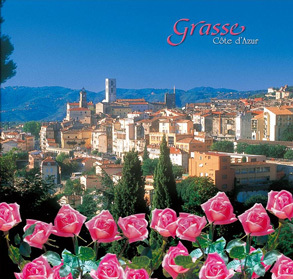 There are other sites of interest (besides those catering to the perfume industry) in Grasse. These include Le Musée d'Art et d'Historie de la Provençe - a museum using the old town house of the Marquise de Clapier-Cabris. Also referred to as Le Petit Trianon, this 18th century mansion houses a wonderful collection of Provençal paintings, pottery, archaeology and ethnology, while also providing a history of the Provençe region. Another museum is the Musée de la Marine, situated in the 18th century Hôtel Pontevès-Morel, it depicts the career of the Admiral de Grasse, who fought in America's War for Independence and was instrumental in the victory at the Battle of Yorktown. The final museum in Grasse houses the work of the famous French painter Jean-Honoré Fragonard. Housed in the 17th century Villa Fragonard it also depicts the life of the painter - in fact he actually stayed here with his family in March of 1791. 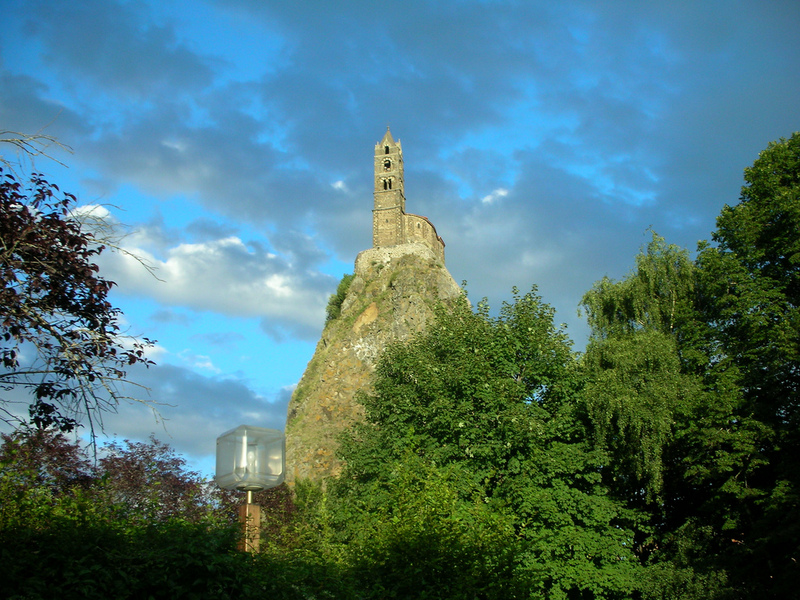 On the subject of paintings, three works of art by Rubens can be found in the Notre Dame du Puy cathedral on the Place Godeau. 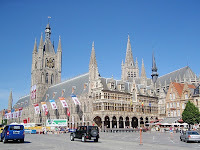 Dating from the 10th - 11th century the cathedral was rebuilt in the 17th century and a clock tower was added in the 18th century. Rubens paintings were originally commissioned by Archduke Albert for the Santa Croce di Gerusalemme in Rome and were completed by 1601. They were given to the town of Grasse in the 19th century. The cathedral also houses the famous painting by Jean-Honoré Fragonard - the 1754 'Christ Washing The Feet of the Apostles'. The main street in Grasse is the Boulevard du Jeu de Ballon and it is here that carnivals take place throughout the year, winding their way through the old part of town, past 17th and 18th century buildings, arched tunnels and tiny squares. The main square is the Place Aux Aires, which is picturesque with its three-tiered fountain in the center. A daily flower and local produce market is held in this square marrying the ancient with the modern. Two major festivals throughout the year pay tribute to Grasse's most important commodity - flowers. The Fête du Jasmin is held in August while the International Rose Festival takes place in May. Historically, Grasse has an interesting story to tell. 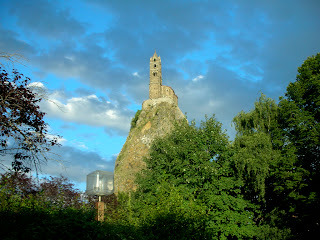 Principally a medieval town (it still maintains this), ancient artifacts can be observed in the area. These include megaliths and mausoleum ruins amongst other archaeological sites. The town did not surrender to raids by the Saracens in the 9th century and by the 12th century it was an independent republic that enjoyed diplomatic relations with Genoa and Pisa (Italy). The surrounding area, including Grasse and Nice, was part of Italy for centuries and Grasse only became part of the Alpes-Maritimes region as recently as 1860 when the country of Nice became part of France. During the French Revolution Grasse was the capital of the Var region. Famous people have always visited Grasse. These have included Napoleon's sister Princess Pauline de Bonaparte who spent the winter of 1807-08 recuperating from ill health here. Napoleon himself passed through Grasse and Queen Victoria stayed at the Grand Hotel or at the Rothschild's here. Tourists continue to visit, lured by the countless activities the town and the surrounding areas have to offer (including caving in the limestone hills north of Grasse) and to buy some of the famous Grasse perfume. The French perfume industry began here in the 16th century. Grasse had been a center for leather and tanning and was famous for glove production since the 13th century. When fashions changed in favor of scented gloves Grasse provided them. Eventually the perfume industry surpassed its' leather industry. Perfumers and apothecaries began to settle in Grasse by the 17th century and the perfumeries were officially registered in 1729. Chanel No.5 is the best-selling perfume in the world and its principal ingredients are rose du mai, jasmine, and a synthetic musk. A few years ago jasmine production was disrupted by bad weather and Chanel took the precaution of buying their own farm in the Grasse area. Run by the Muhl family it produces 20 tons of jasmine and 50 tons of rose du mai annually, exclusively for Chanel. Jasmine Grandiforum was initially introduced into Grasse from Nepal in 1560 and its delicate flowers require careful handpicking from expert pickers who are specifically employed for this purpose. About 8 to 10,000 flowers are equivalent to 1 kilogram and pickers typically manage to harvest ½ kg per hour. More expensive than roses, jasmine fetched 170 francs or approximately $28/kg in 1997 while roses sold for 30 francs or $5/kg. The roses are picked for 6 weeks annually from April to June while jasmine is picked from August until September. Stored in sacks the petals are transported within half an hour at Chanel to the onsite production plant. At other farms extraction of the essential oils tends to take place the next day, but at Chanel freshness is a prerequisite. After weighing they are loaded into huge 50kg vats, raked and washed 3 times using over 2000 liters of the extraction solvent. The solvent dissolves the essential oils, resins and waxes from the petals. Once the flowers are removed from the vats the remaining solvent is vaporized for 1½ hours, so forming a solid known in the industry as 'a concrete'. This can be stored for several years and when the essential oils are required, alcohol is used to extract them. Once the alcohol is evaporated what is left is the purest form of floral scent - known as the 'absolute'. Blending then occurs to create different perfumes. Perfume has always been important in the history of mankind. Used by the ancient Egyptians, Romans, Chinese and mentioned in the Bible it has been used to seduce, to mask unpleasant odors and for other industrial purposes. France has always been a world authority in the industry - the first guild of perfumers was established in the 12th century by Philippe-Augustine of France. Initially, scents were only the privilege of the wealthy, but François Coty from Ajaccio in Corsica changed that by making perfume affordable for the masses in the 1900s. A first cousin of Napoleon de Bonaparte, he studied for a year under the expert tutelage of perfumers in Grasse before opening the 1st mass-production perfume factory on the outskirts of Paris in 1905. After the 1920s many other countries began to manufacture perfume but French perfume is still regarded as the best in the world by scent connoisseurs. There are 3 basic processes for making perfume including: distillation, enfleurage (which was developed in Grasse) and extraction. The four premier perfumeries in France - Fragonard, Galimard, Mane, and Moulinard are all based in Grasse. In conclusion, Grasse the 'Perfume Capital of the World' is truly that. A medieval town it is well worth a visit if only to experience the wonderful fragrances hanging in the air during the summer months. Every time we spray on some perfume, and when a memory is stirred by the whiff of a scent, we should remember that we owe the luxury to the pioneering perfumers of Grasse. Courcheval, France is an excellent place to go skiing. Located in the French alps, it has several resorts to choose from depending on your needs. Courcheval, France is an excellent choice for a ski vacation. Courcheval is located in the French Alps. Well-known for fantastic skiing, Courcheval also offers access to the three valley network, which gives you over 200 ski lifts and 330 downhill runs to choose from. Courcheval itself offers 63 lifts and 117 runs within the four separate villages that make up Courcheval. 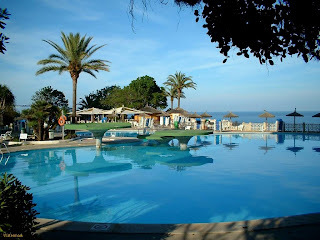 The resorts are based on their height in meters, with 1300 and 1500 being more quiet and family-oriented, and 1650 and 1850 much more cosmopolitan and chic. The ski season goes from mid-November to mid-April depending on the weather. Courcheval does have it’s own snow-making equipment and has been rated very high on both snow quality and quantity. The prices for accommodations in each resort vary. Accommodations in the lower resorts can be had for around $100 per person per night for cheaper rooms to over $600 for the premium accommodations. The resorts of 1650 and 1850 are much more expensive, and small chalets abound for ski parties of just a few to over 30 members. These resorts offer very posh lodgings, with all the trimmings, include on-site catering of three meals a day. These are definitely more expensive, and can run anywhere from $750 a night per person to well over $1000. The easiest and cheapest way to get to Courcheval is by air. The two nearest international airports are in Lyon, France and Geneva, Switzerland. The Courcheval resorts are less than three hours from either airport. Flights from the US to Courcheval will cost anywhere from $690-$1100 on average. However, it is always possible to get a good deal on a flight or entire ski package if you do your research online and go during a non-holiday time of the season. Lift passes are available for only Courcheval and also for the three valleys, which cost a bit more. All four of the villages offer ski and boot rentals. They also offer some great ski instruction and have many good ski schools for those who are just learning or who need to brush up. Courcheval also has activities for the non-shier and for after the skiing is over for the day. Other fun activities include walking trails, sledding, hang-gliding, hot air balloon rides, ice hockey and skating. The two higher resorts have great bars and nightlife, with the best ones being in 1850. There is a bar to appeal to everyone, however some of them are quite expensive. 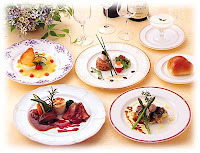 For those on a budget that still want to enjoy some evening fun, the restaurants and establishments in 1650 can offer better prices. For families and those on a very tight budget, the lower two resorts are their best bet. The food is still good, the atmosphere is family-friendly, and you can get an aperitif for a reasonable price. The kind of clothing you will need in Courcheval is similar to any ski resort. It is best to dress in layers, so that you can remove or add layers as needed. Upscale clothes are recommended for evening activities. Anything you don’t have or forgot is available in the shopping areas of the resorts, but will probably be pricier than at home. It is important to dress sensibly and make sure to avoid exposure to the elements for very long periods of time. 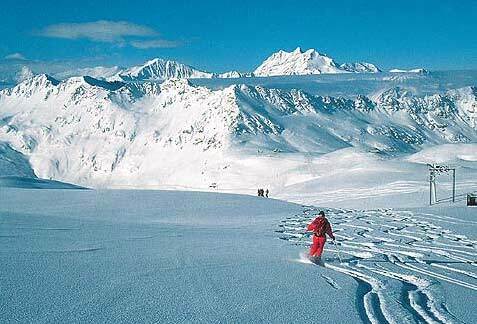 Courcheval is one choice for those looking for an interesting place to go skiing. 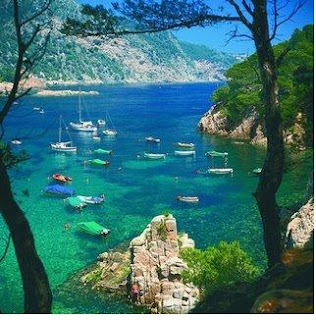 Most visitors think it is worth the price and have an excellent time while there. The people are friendly and helpful, and many speak English for the out of town tourist. Visiting Paris with kids can be a great chance to expose them to culture, but you have to learn to take their special needs into consideration. 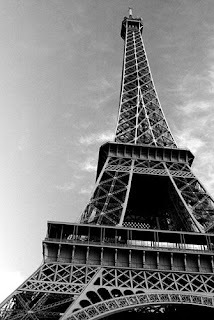 We recently did a spur-of-the-moment trip to Paris with our young son. Although he's well-traveled, we weren't sure how to mix kids and culture on a visit to the City of Lights. After we decided to take advantage of incredibly low off-season fares through a special saver's program, I had five days to plan the five-day trip for the middle of August. Five days! For our trip to Britain last year, we planned for six months. The first thing we did was search the Internet for hotels. Most didn't have online reservations, so we put in requests for information and headed for the bookstore. My husband and I couldn't agree on travel guides, so we bought two: The Complete Idiot's Travel Guide to Paris and Time Out Guide: Paris. Between the two of them, we thought we'd have plenty of information for planning our trip. Wrong! The Complete Idiot's Travel Guide to Paris did provide one essential tip: Aparthotels are the best hotel bets for families. These apartment-hotel hybrids, similar to all-suite hotels in North America, can be big money-savers for families of three or more. Our suite had two separate rooms, allowing us to put our six-year old son to bed early and giving us some privacy. It also had a full bath, something you're not likely to get in a typical European hotel. The courtyard exposure and double-glazed windows made for peaceful nights. On the downside, the rooms were more like modern American hotel rooms, lacking the charm of older French hotels. The mini kitchen in our room allowed us to keep breakfast and snack food, and could easily have saved us a considerable amount of money on meals if we'd chosen to prepare our own lunches or dinners. We were too tempted by the great restaurants nearby to dine in our room, though. Despite the fact that both guides said these section of the city had little to recommend it, we found it charming. We discovered several good restaurants within a few blocks of the hotel, the kind of places that catered more to locals than tourists. In the evenings, performers took up their posts in the plaza, juggling flaming batons, strumming guitars, or miming in classic French fashion. Unless you are familiar with French driving, do not plan to drive in Paris. You're much better off using their excellent Metro system. Your feet will thank you, and you won't have to worry about parking. Metro passes are inexpensive, and can be bought individually or for a set number of days. Inquire at the station to find the best options for your trip. Don't succumb to the temptation to try and see everything Paris has to offer. Be selective, get input from your kids, and make sure to take plenty of breaks. Remember that vacations are not marathons, and your children will not thank you for making them endure endless museums and mile-long queues. Even if you've visited Paris before, you may find that bringing your children will show you a side you've never seen. The French, and perhaps Parisians in particular, dote on children. They are very welcoming toward young visitors of any nationality. In shops, clerks seem to go out of their way to find just the right souvenirs. In restaurants, they may try to accommodate unusual requests more easily than they would for an adult. disappointed. The food was mediocre, the service was awful, and the prices were outrageous. We learned our lesson: ALWAYS read the menu posted outside before going inside. If we'd taken that simple precaution, we'd have realized this placed specialized in duck and liver dishes, leaving nothing our usually adventurous six-year old even wanted to try. We chose safe beef and fish dishes, thinking he could sample our meals, but the beef was tough and strong-flavored, while the fish was bland and over-cooked. If you want to save money and still have a satisfying, quick lunch, try one of the many creperies. You can order salee (salty) or sucre (sweet), for lunch and dessert. The crepes are large, thin pancakes, filled with savory ingredients like ham and cheese, or Nutella and hazelnuts. Best of all, they're good finger food, and kids love them. Another great idea: The plaza near our hotel, in Place des Halles, sported a McDonald's, Pizza Hut, KFC and Chicago Ribs. We found that feeding our son on familiar food before going out to dinner accomplished two things: he got to eat something he recognized and enjoyed, and he was much more patient during the long restaurant meals. While he's not normally a picky eater, he definitely doesn't like long waits for his meals. If you want to bring a few taste treats back home, many shops in the Latin Quarter offer gourmet food items packaged for export. You'll also find many delis and shops where you can sample pastries, pates, and other delights. We knew ahead of time we'd have to limit our time in art museums, which aren't stimulating enough for a six-year old, so we bought a Carte Musee at the Metro station. These passes are a great deal for several reasons: (1) They let you go to the head of the line or use a separate entrance at most museums, with more than 70 museums and monuments included. When you see some of the lines, you'll realize what a time-saver this can be. (2) They can be bought for one, three or five days. Add up the admissions to the museums and monuments you plan to see to find out if it's a good deal. (3) If you have the pass, you're more likely to visit marginal places (some of which are real finds). Plus, you won't feel bad if your kids start whining at the Louvre and you have to leave after two hours, or if your feet are killing you and you just need to go sit down at a café and take a break. 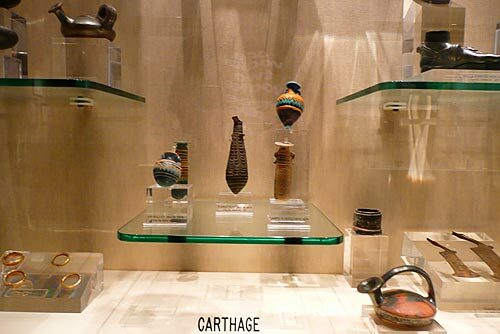 The museum pass also allows you to key in on a few highlights rather than struggling to see entire collections in order to get your money's worth. Try to focus on art objects or paintings your kids will recognize and remember. On the way to see the Mona Lisa, for instance, you can enjoy the Louvre's exceptional Renaissance art collection. A brief detour will allow you to browse through the Impressionists while you make your way through the gallery to see Whistler's Mother. Our favorite place was one the guide books gave a thumbs-down: the Musee de L'Armee military museum. Although the main attraction here is Napoleon's tomb, that was a mere footnote to our visit. The collection of medieval weapons was what caught - and kept - our attention. Our son, a history buff like his parents, would have gladly spent two more hours touring the weapons collections. I'd read the description, and thought it would be a hit, but our guide books didn't agree. One, The Complete Idiot's Travel Guide to Paris, said the museum was tedious. The other suggested it would be good for weapons buffs, especially the World War I and II collections, which we never even saw. Another bonus: it wasn't crowded at all, so we had plenty of time to browse and enjoy. On the other hand, the Musee de Moyen Age was a disappointment. We went there expecting a glimpse into medieval life, but saw mostly artwork and tapestries. 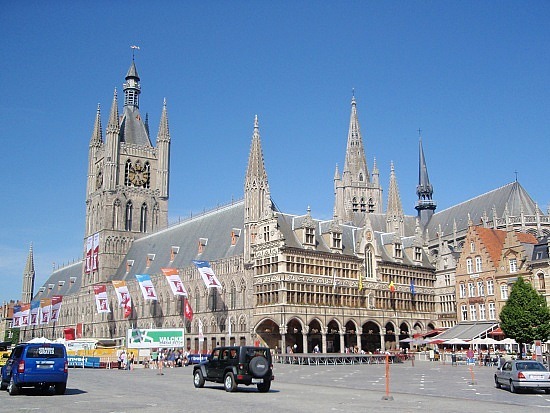 It was more a museum of medieval art than a look at the Middle Ages. Although August is supposed to be the off-season, most of the tourist sites were incredibly crowded. The worst was Versailles, which was so jam-packed with tour groups that we just pushed our way through without pausing to admire the art and architecture: a pity because the palace and gardens are quite beautiful. The crowds and the din of multi-lingual tours detracted too much from the splendor. Add to that the fact that the grounds had three restrooms for about 10,000 visitors, and you have the makings of a real nightmare. Ditto for the Eiffel Tower. After spending two hours in line (our pass didn't include this site), we were so pressed and oppressed by the crowds that we couldn't wait to leave. The view may have been magnificent, but we had trouble seeing anything over the heads of all the other visitors. The stairs at the Arc de Triomphe are hard on the feet, and may be difficult if you've must maneuver young children and strollers up the narrow staircases. The view at the top is worthwhile, but the kids may not be impressed. Far better, in that regard, is the Notre Dame Cathedral. For one thing, most kids are familiar with the Hugo's story of the hunchback, if only from the Disney film. For another, they'll be so delighted with the gargoyles, they'll probably forget how many steps they had to climb to see them. The sewers were supposed to be a sure bet for kids. What they really were was a smelly look at a very modern sewer system, with a little history thrown in. Definitely not worth the trip, especially not since our clothes ended up smelling of sewers for the rest of the day. A better bet is the Champs Elysee, which has plenty of shops, arcades, and cafes. Our son especially liked the Lego store; in fact, he seemed to have a sixth sense, unerringly ferreting out the store in a vast arcade of shops. And, while you may not find haute couture, you will find plenty of clothing shops catering to all tastes. When you're tired of walking, head for one of the city's many parks. Most have playgrounds, with nearby benches for weary parents. You'll soon realize that language is no barrier, as your kids quickly find playmates. Snacks and drinks are available at kiosks, so you can stay as long as you and your kids need the break. Rest assured that, no matter how much planning you put into your trip to Paris, your kids will remember the strangest things: the playgrounds in every park, the pay toilets that are nothing more than holes in the ground, and the fact that you must never, ever walk on the grass.